Everyone worries or feels anxious from time to time. Anxiety is a normal and expected feeling to have in certain circumstances. It's our body's way of telling us that something's wrong, to help us focus and to take action to deal with the source of our stress. So how do you know if what you're experiencing is everyday worry, some anxiety or possibly an anxiety disorder? One of the main things to look out for, according to Greer Slyfield Cook, social worker and therapist in the Women's College Hospital (WCH) mental health program, is when it becomes unhelpful and starts to impact your life in a negative way. "One of the differences between experiencing everyday worry and having anxiety is that worry is more of a cognitive experience – typically inside your head alone – whereas anxiety has three components: cognitive, emotional, and physiological,” says Slyfield Cook. Along with the thoughts in your head, anxiety can include emotional aspects (eg. fear, guilt, sadness) and physiological responses (eg. racing heart, upset stomach, tight chest). "With everyday worry, you might have a fact that's related to it and it can motivate you think of solutions or actions to the problem,” says Slyfield Cook. Everyday worry is often not very intense and alone usually doesn't interfere with your functioning. Anxiety tends to be a much more intense experience and can have an impact on various aspects of your life, for example sleep, appetite, relationships, work, social life and more. If you think you might have anxiety, are struggling with some of the symptoms, or if you're unsure, speak with your doctor or healthcare provider who will be able to help you. Focus on today and the present moment. Bringing yourself into the moment can help you make a conscious choice about what to do next. "Ask yourself – what is in my control, and what's not? If what's on your mind is about yesterday or tomorrow, it's not within your control to manage. Focus what's in your control – that is, today and the present moment,” says Slyfield Cook. 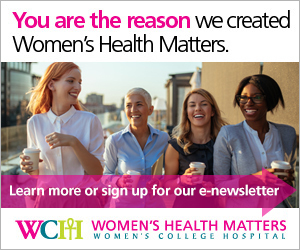 This information is provided by Women's College Hospital and is not intended to replace the medical advice of your doctor or healthcare provider. Please consult your healthcare provider for advice about a specific medical condition. This document was last reviewed on: December 14, 2018.